ABLE United has chosen Bloggin' Mamas once again to help share their program and insights. Babushka is very feliz and proud that they have picked her for this campaign and opinions expressed are all BB's. Time. El Tiempo. It goes by so quickly doesn't it? Unless it's something you don't like, or something that seems unsurmountable. For BB that would be saving dinero. Quee?? Y'all thought at this age Babushka would have had that all figured out verdad? JU SO FONII!!! Pero at this age BB has something worth making the extra effort. Just ayer The Trio were babies, and now their babies are growing up. There are things this abuela would like them to have. For La Princesa, her autism will make things a little trickier to realize her dreams. 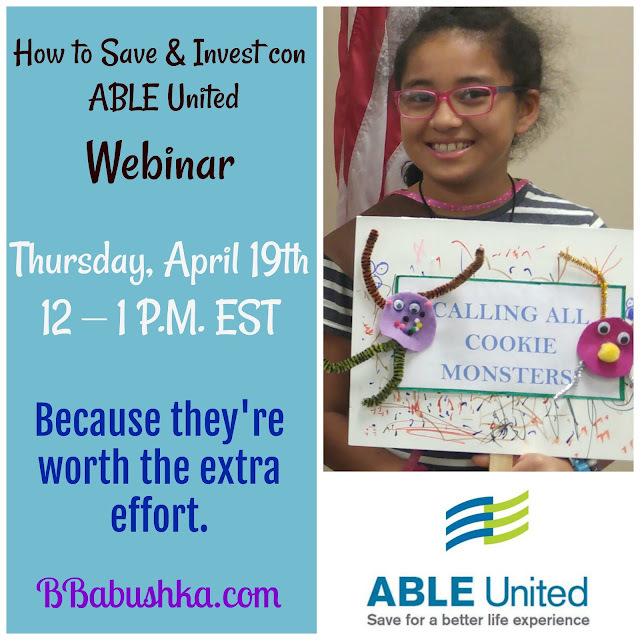 ABLE United savings is definitely a plus to achieving them. "Financial decisions impact our everyday lives, from budgeting for weekly groceries to determining investment options for retirement. Financial literacy is the first step to achieving financial independence; however, many in our community need resources and targeted education to help them better understand the issues affecting their finances – particularly the disability community. In celebration of National Financial Literacy Month, ABLE United is hosting a webinar on how you can save tax-free and invest for you or your loved one’s future. Representatives from Callan, ABLE United’s investment consultants, will help current and prospective account holders understand investing, risk, performance, and the differences between each of ABLE United’s investment options." and start saving for a better life experience – and make sure to use “BABUSHKA17” upon sign-up to receive a free enrollment package. Y alli lo tienen Beautifuls, there you have it. All the details and encouragement to save for your loved one.Porque time goes so quickly and it's not as difficult as you imagine it to be.